Our universe is the biggest laboratory ever accessible to human beings. The physical knowledge known to us on Earth has already been challenged by cosmological observations of the formation of galaxies and the accelerating expansion of the Universe. In order to establish a cosmological standard model without inconsistency between observables and our understanding of physical science, it is unavoidable for us either to assume the presence of as yet undetected dark materials filling 95 % of the total energy in the Universe, or to abandon some of the fundamental laws of modern physics, such as Einsteins general relativity. These cosmological observations suggest modifying our standard cosmological picture based upon known materials and fundamental laws on Earth, but current observations do not provide enough information to explain the abnormality at cosmological scales. The information of underlying science about the universe is given by looking at structure formation at large scales. While current observations revealed the breakdown of our knowledge of physical science at cosmological scales, the future observation of large scale structure formation will provide us with a clue as to which part of our physical science should be modified - matter or gravity. The next generation of cosmological observations will be launched to scan inhomogeneity at large scales, such as SDSS3, DES, EUCLID and LSST. These experiments be optimally designed to answer the question whether our understanding of nature on the earth is universal or not. We plan to work on how to read signatures of our fundamental knowledge of nature imprinted on large scale structure formation, how to falsify different approaches - dark materials or violation of fundamental laws - and how to develop computational and observational techniques to transform raw data sets into understandable physical knowledge. We are at a critical moment of understanding of Nature, and we need inter-communicating leadership between theoretical knowledge and observational techniques. We have developed research to meet such a need. In order to predict theoretically the expected large scale strucutre formation to be tested using observed data, we develop the evolution of linear cosmological perturbations in different types of theoretical models to generate cosmic acceleration at later time, such as exotic dark energy models, brane world models and f(R) gravity. Exotic dark energy models: Dark energy in General Relativity is typically non-interacting with other matter. However, it is possible that the dark energy interacts with the dark matter, and in this case, the dark matter can violate the universality of free fall (the weak equivalence principle). We showed that some forms of the dark sector interaction do not violate weak equivalence. For those interactions that do violate weak equivalence, there are no available laboratory experiments to probe this violation for dark matter. We study a cosmological test for violations of the equivalence principle between dark matter and baryons via a test for consistency of the observed galaxy velocities with the Euler equation. In addition to this, we study the impact of dark energy perturbations on dark matter and metric perturbations in various circumstances. We found that gravitational instability develops through the tension between pressure support and anisotropic squeezing effect of dark energy perturbations. 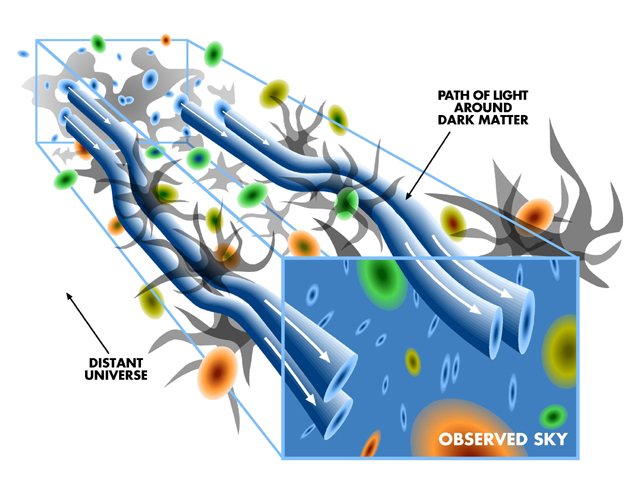 We propose generalized conditions for dark energy clumping and its cosmological consequences. Brane world model: Dvali, Gabadadze and Porrati (DGP) proposed a brane world model embedded in the Minkowski 5D dimension, which has been taken as an alternative theory to explain cosmic acceleration. Deffayet discovered the accelerated phase in self-acceleration branch without cosmological constant. While it has been tested geometrically by many authors, the detectability will be enhanced by the structure formation test. The distinct evolution of perturbed gravitational potential of DGP model has been studied by us at scales in quasi-static limit and scales at nearly horizon size. DGP strengthens the integrated Sach- Wolfe effect, and leaves a detectable signature on CMB power spectra and ISW-galaxy cross- correlation. We study the large scale structure formation of DGP by using the scaling method developed by us. On-brane equations of motion are not in the closed form without the information of the gradient crossing the bulk direction. Off-brane equation of motion should be coupled in order to supply this gradient of perturbations at the location of brane. We assume the scaling ansatz for the perturbation on the brane, and solve it iteratively until it converges. We find that the quasi-static limit is valid at scales relevant to ISW-galaxy cross-correlations and other cosmological probes such as weak lensing and redshift distortion experiments, and study the detectability of this model. F(R) gravity model: Cosmic acceleration can be explained either by missing energy with an exotic equation of state, dubbed dark energy, or by a modification of gravity on large scales. Indeed the cosmological constant can be considered either as a constant added to the Einstein-Hilbert action or as vacuum energy. Non-trivial modifications where the addition is a non-linear function f(R) of the Ricci scalar that becomes important only at the cosmologically low values of R have also been shown to cause acceleration. They are furthermore free of ghosts and other types of instabilities for a wide range of interesting cases. Solar-system tests of gravity provide what is perhaps the leading challenge to f(R) models as a complete the- ory of gravity. The equivalence of f(R) models to scalar-tensor theories lead to conflicts with parameterized post-Newtonian constraints at a background cosmological density of matter. It is however still controversial whether the whole class of f(R) modifications can be ruled out by this equivalence. Matter in the solar system becomes non-minimally coupled in the transformed frame leading to non-trivial modifications of the scalar field potential. In the original Jordan or physical frame, it has been shown that the Schwarzschild metric solves the modified Einstein equations of a wide range of f(R) models but this solution is not necessarily relevant for the solar system. Recent work has also raised the question as to whether solar-system gravity problems may become tractable if f(R) is viewed as simply a first-order correction term to the high R limit of general relativity. Regardless of the outcome of small-scale tests of gravity in f(R) models, it is worthwhile to examine the cosmological consequences of treating f(R) as an effective theory valid for a cosmologically appropriate range of curvatures. At the very least by making concrete predictions of cosmological phenomena in these models, one gains insight on how cosmology can test gravity at the largest scales. We develop linear perturbation theory for predicting cosmological observables such as the Cosmic Microwave Background (CMB) and the large scale structure of the universe exhibited in galaxy surveys. We work in the physical frame where the matter is minimally coupled and obeys simple conservation laws. Developing post Newtonian parameters: Next generation surveys will observe the large scale structure of the Universe with unprecedented accuracy. This will enable us to test the relationships between matter over-densities, the curvature perturbation and the Newtonian potential. Any large-distance modification of gravity or exotic nature of dark energy modifies these relationships as compared to those predicted in the standard smooth dark energy model based on General Relativity. In linear theory of structure growth such modifications are often parameterised by virtue of two functions of space and time that enter the relation of the curvature perturbation to, first, the matter overdensity, and second, the Newtonian potential. We investigate the predictions for these functions in Brans-Dicke theory, clustering dark energy models and interacting dark energy models. We find that each theory has a distinct path in the parameter space of modified growth. Understanding these theoretical priors on the parameterisations of modified growth is essential to reveal the nature of cosmic acceleration with the help of upcoming observations of structure formation. To understand the origin of the accelerating expansion of the universe is one of the key questions in contemporary cosmology. It is commonly attributed to the existence of some unknown physics, loosely labelled dark energy (DE). Alternatively, it might cast some doubts on the theoretical foundation of current cosmology, that is the theory of general relativity (GR). From a theoretical point of view, as most efforts to construct self-consistent DE models within GR seem unsuccessful, there is no a priori reason to rule out a modification to gravity on cosmological scales. 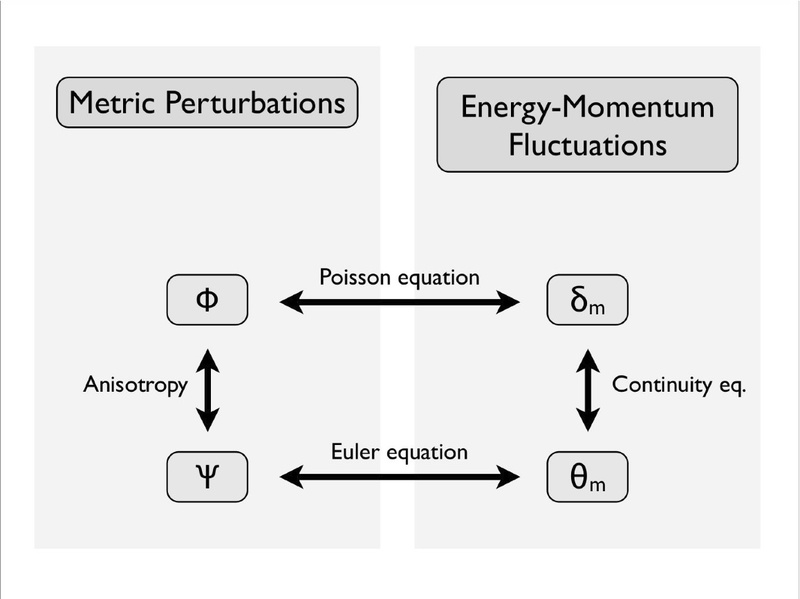 As seen in Figure 2, there are four fundamental equations governing the relationships between the energy and momentum perturbations (density fluctuations and peculiar velocity), and the metric perturbations (Newtonian force and curvature perturbation). From this basic set, we can form pairs of estimators, predicting the result of a measurement drawing from one side of the equation, to another measurement based on the opposite side. If these relations are found to be inconsistent, it would be a clear signal of a breakdown in GR. Weak gravitational lensing is generated by the gradient of metric perturbations, making it a direct probe of those perturbations. For the right side of the equation, we need an estimator sensitive to density fluctuations. This can be found directly from the pair-wise velocity dispersion, which generally requires a redshift survey. There are potential complications due to non-linearities, but at large scales the combination of these two measurements gives us an estimator for deviations from the Poisson equation that should be detectable at the few percent level with these future surveys. Observable distortions of the distant universe due to weak gravitational lensing (cosmic mirage) are predictable given a cosmological model. Future experiments will do this in a variety of ways. Because of the redshift-distance effect of the Hubble expansion, multi-color deep imaging survey will provide distances to galaxies out to redshift 3. We can subdivide these galaxies into many redshift or distance bins and then perform lensing tomography: measure how the cosmic mirage effect changes with distance. If the galaxies can be separated into n multiple redshift bins, then we can create n shear maps. The most interesting statistical properties of these maps are the shear-shear correlation functions. These n(n+1)/2 unique shear power spectra can be written as projections of the matter power spectrum along the line of sight out to some redshift. The resulting tens of shear cross correlations vs redshift are very powerful independent probes of the expansion history in Figure 3. It is clear that the unparalleled survey area allows a significant detection of the power spectra over a wide range of angular scales, from degree scales to arcminute scales. Jointly, these correlations contain enough information to determine cosmological parameters, including dark energy parameters..
One of the most direct methods of testing our assumed theory of gravity is to perform consistency checks between the geometrical expansion history of the Universe, as measured by cosmological probes like Type Ia Supernovae and the Baryon Acoustic Oscillations, and the evolution of density inhomogeneities in the Universe. 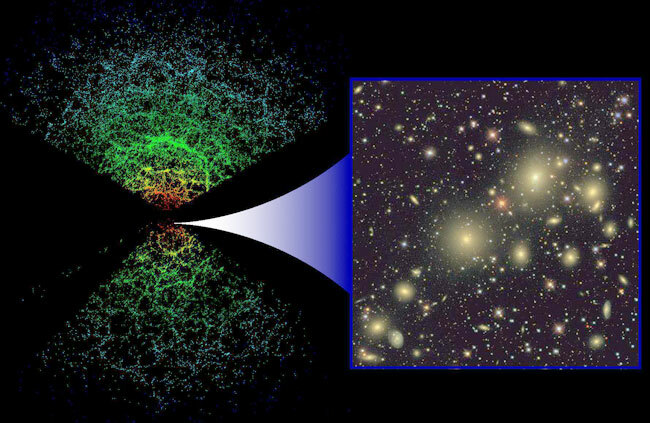 The growth of structures in the Universe can be measured using a variety of techniques, but a popular and direct method involves measuring the coherent peculiar velocities of galaxies on large scales (i.e., the motion of galaxies after the cosmological expansion has been removed) caused by their infall into large scale overdensities like clusters and superclusters of galaxies. Traditionally, the local peculiar velocity field has been estimated using samples of galaxies where the peculiar velocity of each galaxy has been determined using secondary distance indicators (e.g. the Tully Fisher relationship or Fundamental Plane. Alternatively, the coherent motion, or flow, of galaxies can be statistically estimated from their effect on the clustering measurements of large redshift surveys, or through the measurement of redshift space distortions. Historically, measurements of the local galaxy peculiar velocity field have been plagued by systematic uncertainties, and small sample sizes, which have made their cosmological constraints uncompetitive compared to other probes of the Universe. However, a recent reanalysis of these earlier peculiar velocity galaxy surveys has now provided a consistent observational picture from these data, and finds significant evidence for a larger than expected bulk flow in the local Universe (within 100 Mpc/h). This new analysis is also consistent with new measurements of the local bulk flow using the kinetic Sunyaev-Zeldovich effect of massive clusters of galaxies out to at least 800 Mpc/h, which leads to the intriguing situation that these local measurements appear to be significantly greater in amplitude, and on larger scales, than expected in a concordance, WMAP7 normalised LCDM cosmological model. Such discrepancies with LCDM may give support to theories of modified gravity. Given the importance of these local large scale bulk flow measurements, we investigate the likelihood of such large coherent flows using an alternative methodology based upon measurements of the redshift space distortions seen in the clustering of a sample of galaxy clusters selected from the diverse observations. The goal of this study is to statistically study the likelihood of the local local bulk flow measurements within a large cosmological volume of the Universe, well beyond these nearby measurements. Although galaxy is not an unbiased tracer of the large scale matter distribution predictable from linear gravitational theory, various statistical meth- ods using galaxy redshift survey have been developed to probe the nature of cosmic acceleration such as dark energy or modified gravity. Acoustic peak structure imprinted on density field inhomogeniety provides mapping to the large scale power spectra in transverse and longi- tudinal directions. This appears to be a standard ruler tracing the relation between redshift and expansion rate (BAO). Additionally, as galaxies are expected to act nearly as test particles within the cosmological matter flow, the motions of galaxies carry an imprint on the rate of growth of large scale structure and allows us to constrain cosmological models. Despite the intensive studies of both methods constraining cosmological parameters, the coherent way to combine both has not yet been fully optimized. Both different statistics can be combined coherently exploiting decomposed density-density and velocity-velocity spectra in real space from the observed redshift distortions in redshift space. The Fisher matrix exposition was developed, assuming strict functional forms for the power spectra or allowing them to float freely. As expected the constraints are tightest when theoretical investigations can provide good priors for the form and range of parameters, but even relatively conservative assumptions suggest that percent level of decomposition should be possible with future surveys. The cosmological distance errors are achievable using BAO preserved on decomposed density-density spectra, which is degraded a few factors of order from BAO of full observed power spectra. Decrement is compensated by adding cosmological constraints from the decomposed velocity-velocity spectra utilizing the growth of large scale structure as imprinted on dynamics of galaxies observed in large redshift surveys. Tighter constraints are achieved by this combination as well as dark energy constraints can be cross checked by two different alternative approaches; distance measures and large scale structure formation observables. The standard cosmological model is dominated by two unknown components, dark matter and dark energy, that collectively account for 95% of the Universes total energy budget, and yet whose nature is entirely unknown. Dark matter and dark energy cannot be explained by modern physics, the illumination of the nature of these fundamental constituents of our Universe will mark a revolution in physics impacting particle physics and cosmology and will require new physics beyond the standard model of particle physics, general relativity or both. To understand our dark Universe cosmologists have developed complex statistical tools that require information from many billions of galaxies. To create predictions using non-standard models that can then be used to predict the future outcome of experiments, or analyse cosmological data, many models have been developed that exist in the form of software packages. This project will involve the implementation of parameter estimation methodologies based on machine learning and optimisation to aid in fitting the parameters of the existing models. A possible method is to use evolutionary computation. To make the solution available to the cosmology community the goal is then to create a computational portal to allow cosmologist to search parameter space, given some data, on-line. This is a fraction of the work required, but an important step to get the result of your other efforts used. We develop the full pipeline to undertake those missions in KIAS.